U-Haul® is reintroducing its reusable one-pound propane gas cylinder in California. The handheld tanks are now available at 135 U-Haul stores across the state. Ecofriendly reusables are the preferred alternative to disposable one-pounders that are hazardous to the environment and cost cities hefty sums of taxpayer dollars to process once they are tossed. The U-Haul reusable one-pound propane cylinder, manufactured by Flame King®, has an initial shelf life of 10 years and is priced from $11.95 to $13.95. The cost includes a filled cylinder. Refills cost just $1.95. Only trained propane professionals should fill and refill the cylinders. Reusable one-pounders are popular among campers and tailgaters. They can be used to fuel portable grills, small stoves, portable heaters, lanterns and more. Competing retailers in California and online are charging up to $17 for similar reusable one-pound cylinders that are unfilled. Disposables can cost from $4 to $7 in California with 80 percent of the purchase going toward the canister. 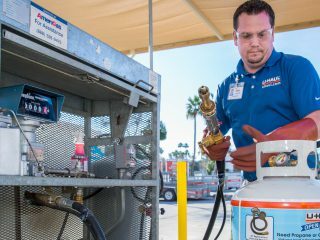 Factor in the environmental pitfalls and financial burdens that cities bear to process disposables, and the benefits of reusable propane gas cylinders are clear. The California Product Stewardship Council and U-Haul are offering one free reusable one-pound propane cylinder to all customers who bring in two empty disposables from 7 a.m. to 7 p.m. on Monday, Feb. 18 at U-Haul Moving & Storage of Oceanside at 802 S. Coast Hwy. The CPSC’s Refuel Your Fun campaign asks Californians to switch from disposables to more efficient reusables. “Thanks to the leadership of U-Haul, Californians can conveniently choose to reuse by switching to reusable 1 lb. 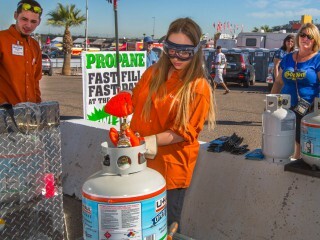 propane gas cylinders when fueling their fun to save money, hassle, and the environment,” said Jordan Wells, Refuel Your Fun campaign manager. U-Haul began offering a reusable one-pound cylinder in 2016. Sales temporarily ceased in May 2017 due to a manufacturer’s recall for a valve assembly issue. Flame King has since addressed the issue to ensure customer safety. U-Haul began selling propane in 1984. It became the largest U.S. retailer of propane by 1987. Today, U-Haul safely supplies propane to thousands of customers daily across the U.S. and Canada. U-Haul promotes sustainable solutions through its core business model of truck and trailer sharing; by reusing of old and often vacant buildings for its new stores, which cuts down on new-construction emissions and helps cities with their unwanted inventory of unused buildings; by curbing emissions through fuel efficiency and the proximity of neighborhood dealers to residential areas; by offering green products like biodegradable packing peanuts, boxes made from recycled cardboard, and furniture blankets made from recycled denim; and by offering in-store programs like Take A Box, Leave A Box and Re-Use Centers that serve as redistribution hubs for gently used household furnishings.